Goldilocks & Her Doodle: Lotsa Doodles Calendar Giveaway! 10,000. Does this number mean anything to you? It means an awful lot to me because last week I hit 10,000 PAGE VIEWS on goldilocksandherdoodle.com! Since I began blogging on May 28th, the week prior to bringing the Milt home, I have garnered 10,000 viewings of my blog (plus lots of doodlekisses.com views), and I am positively thrilled. To all of my loyal readers, thank you for reading multiple times a day (Mom), checking in weekly, or occasionally perusing monthly. I sincerely appreciate it all. These past six months of writing about our little goldendoodle have been a whole of fun, challenging at times, and overall rewarding. Blogging has really allowed this writing teacher to practice her trade. To thank all of you, I am giving away a Lotsa Doodles Calendar, featuring none other than the Milt! All you have to do is comment on this post at www.goldilocksandherdoodle.com and tell me why you would like a calendar. This giveaway will run from today, Thursday, November 15th at 7:00A.M. until Monday, November 19th at 9:00P.M. Feel free to comment once daily during this time span, and I will add your name into my shoebox drawing (saavy, I know!) each time. Once the contest closes, I will randomly generate a winner by sticking my hand in and pulling out a slip. I will announce the grand winner in Tuesday morning's post and drop the calendar in the mail. 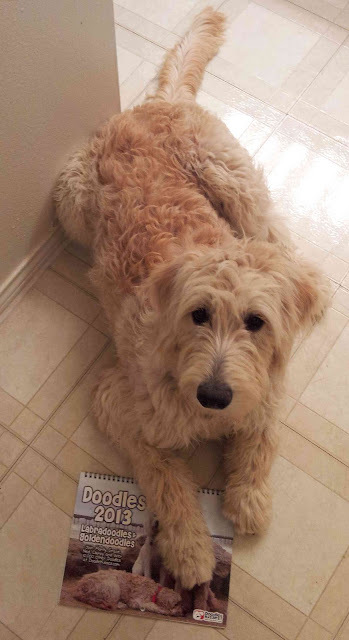 Thank you all so much for following, and I hope you continue reading the adventures of Milton the Goldendoodle. congrats again on 10,000 views! I would love a Doodle calendar. It would give my dull office a little Doodle to match my computer background. Why would I love a doodle calendar? Well first of all, The Milt is in it! But the biggest reason is this doodle mommy knows exactly how much you love your boy because my doodle boy is JUST as awesome. Besides, if it's hanging in my kitchen my sister will see it regularly and maybe SHE'LL cave and become a doodle mom sooner rather than later. Okay, I was AWOL this weekend so I came back for one more try to win The Milt's calendar......I mean the doodle calendar.